A quietly running stream won’t make “tenacious grace” but after it thinly freezes over, it may sculpt the underside of the ice with the gently running water and any air bubbles that get trapped there. The resulting patterns can be very photogenic. 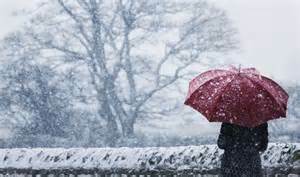 A special instance of ice is freezing rain. Look for interesting things—grasses, leaves, branches, and twigs, etc., encased in it. Exposure can be tricky with the reflected light, so bracket your exposures! 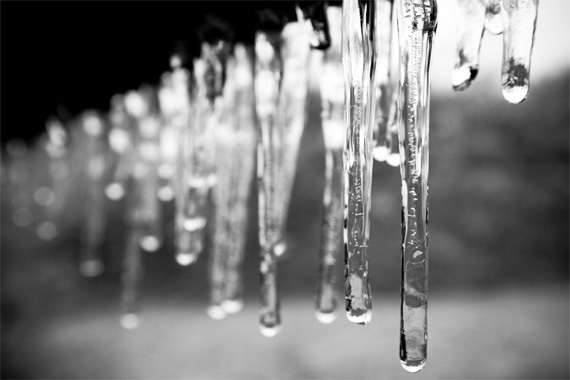 Spikes of ice formed when ice or snow is melted by sunlight or some other heat source, and the resulting melted water runs or drips into an area where the temperature is below the freezing point, causing the water to refreeze. Over time continued water runoff/dripping causes the icicle to grow. 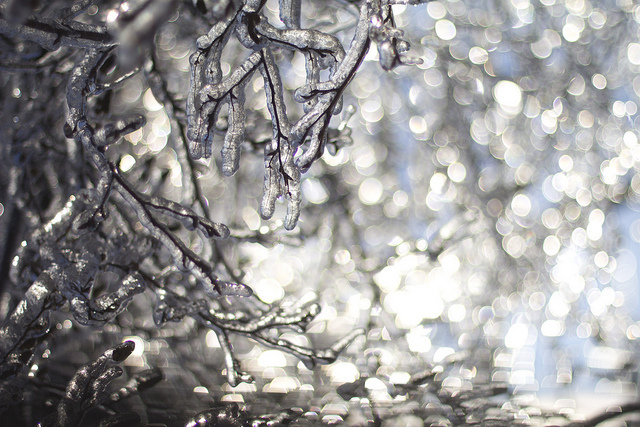 Icicles can be found under roof edges of buildings and on branches and twigs, etc. Whether solitary or in groups, they can be very photogenic when back or side lit or hanging against a dark background. Choose the projects that interest you most. Follow the photography tips conscientiously. Re-shoot when you aren’t satisfied. Do it til you are satisfied. It’ll take all your patience and passion. Your skills and eye will improve with the practice. Shoot especially in early and late light. Use a tripod as much as possible. Edit your results relentlessly. Pin small samples on the wall for a few days to study before making final prints for wall art. 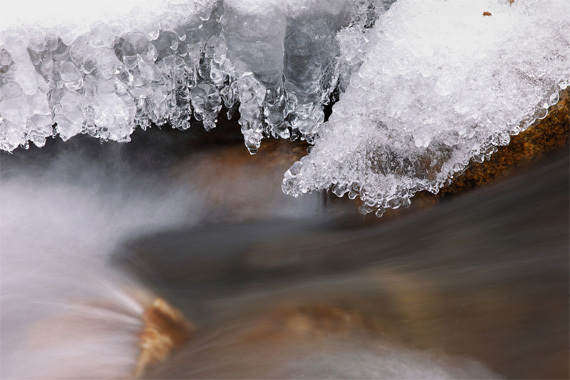 Icy Streams: Locate a quietly running stream in freezing weather and it will probably form smooth ice on top. The underside of the ice will be etched by the running water and any air bubbles in it, creating lines and patterns. Shoot straight down on it for an overall sharp picture. Freezing Rain: When a heavy freezing rain falls, the problem becomes one of too many interesting things to shoot! Take your time and look around to find something really outstanding, more or less by itself, with a dark or strongly colored background and shoot it. Icicles: In freezing weather check out the eaves troughs around rooftops of houses and heated garages, looking for icicles. Try, if possible, to find them around eye level or slightly lower so you can keep the entire icicle(s) sharp top to bottom when you take your pictures. 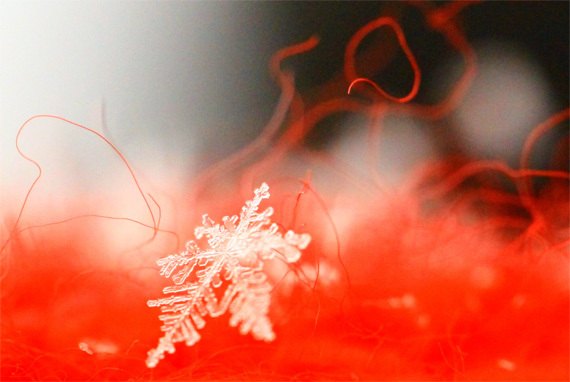 Set up your snowflake “studio” and proceed to get a couple of flakes together on your microscope slide. Place the slide above a piece of medium-dark blue poster board, and then shoot straight down on the flakes. John Maxymuik authored this article which is 1 of a set of 6 on “Photography Tips For the Photo Doldrums” providing tips to break the grip of the photo doldrums using the “ideal photo subject”. To see examples of photography that made use of the “ideal photo subject” go to his fine art photography website at ambienceimages dot net.